L3 acquired the assets of MITEQ, Inc. on January 21, 2015. The business was combined with L3's Narda Microwave-East business which is also located in Hauppauge, NY, and the new organization is called L3 Narda-MITEQ. Read the press release on the L3 Corporate website. 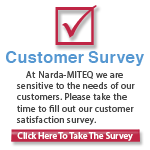 L3 Narda-MITEQ is the recognized leader in the Microwave & RF industry. For over 60 years, we have leveraged our innovative spirit and technical expertise to design and manufacture the widest range of catalog and custom components and subsystems. Our Component, SATCOM and RF Safety products, notorious for durability, reliability and performance are present in every RF application imaginable, military or commercial. We offer a broad range of Passive/Active Components and Subsystems, including Amplifiers, Mixers, Oscillators/Synthesizers, Couplers, Power Dividers, Fiber Optics, PIN Diode Control products, as well as SATCOM Solutions and RF Safety monitoring equipment. We are dedicated to achieving technical excellence, producing quality products and satisfying our customers' specific needs. Browse our product line by using the navigation bar above, and visit the sales rep tab to find excellent service in your local area.